RMS & OMS version 2.3, planned for 17 November 2017. Prior to the version 2.2 the EMA will run another round of OMS user acceptance testing (UAT), commencing 15 September 2017. 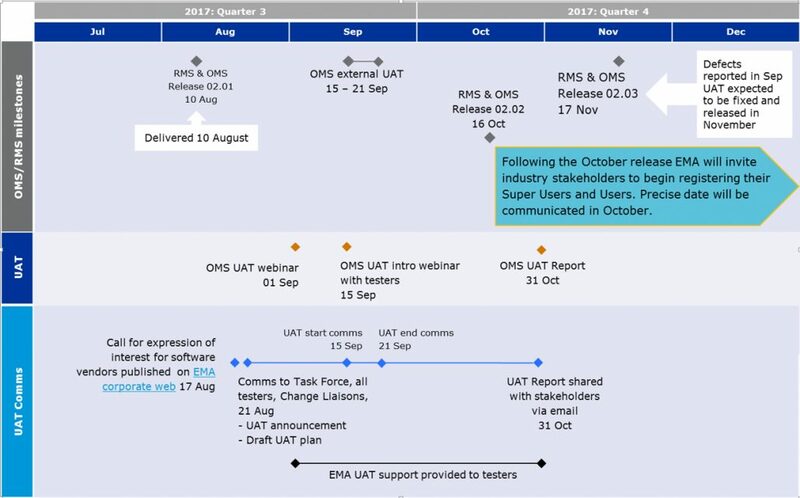 The scope of this round of the OMS UAT will cover functional areas not tested, or which were unsuccessful, in the previous UAT held in March/April 2017. Participation in this UAT is open only to those testers who participated in the previous round of UAT, plus those Industry Vendors who submitted a request during the recent Call for Expressions of Interest (closed Thursday 31 August). The results of this round of UAT should be issued formally before the end of October 2017. Defects reported are expected to be fixed and included in version 2.3, due for release in November 2017. A slide deck from the OMS UAT preparatory webinar held on 1 September 2017 can be accessed here (choose documents / view). Following the October 2017 release (version 2.2), EMA will invite industry stakeholders to begin registering their Super Users and Users. Precise date will be communicated during October.